Did you know that Chicken Soup for the Soul makes cat food and dog food? Yep!! I said dog food and cat food!! I love Chicken Soup for the Soul and everything they make. It's like they put their heart and soul into everything they do. One of the great things about them is that they not only provide great nutrition for animals but they also help animals in need. They use rescue dogs as their models and donate money to the animal shelters. This is important to me because both of my dogs and our cat are rescues. In addition, they donate a portion of their sales to the Humpty Dumpty Institute. Chicken Soup for the Soul and the Humpty Dumpty Institute work together on several initiatives such as literacy, hunger, and animals. Now comes the real question, will my dogs and cat eat the food? Well, yes they did, and they did it was gusto. 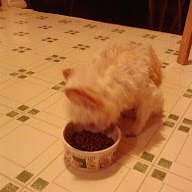 Of course, my cat will pretty much eat anything but at least I know the food is good for him. 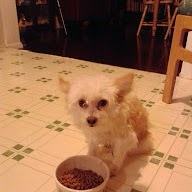 As for the dogs, Gizmo is kind of a picky eater when it comes to dog food. I wasn't sure if he would go for it or not. He sat their and smelled the food for a minute or so, then finally tried it and it was gone before I knew it. Keko did not hesitate at all. She ate her food as fast as she possibly could. I sometimes worry about her because she eats so fast. At least, with the Chicken Soup for the Soul Adult Small Bites, I don't have to worry about her chocking on the food as much. The Adult Small Bites is exactly that, small tidbits of food. 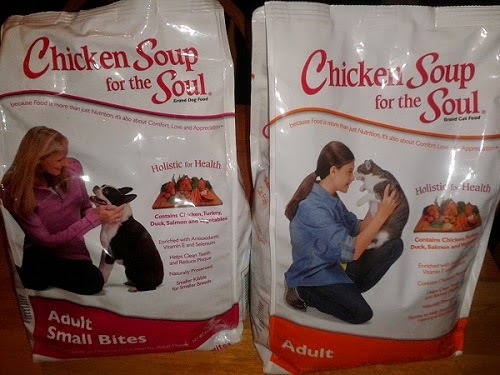 I have to say that the Chicken Soup for the Soul Cat Food and Dog Food are a huge hit in my family. My fur babies love their new food. I love that it is good for them, that by buying the food I'm helping other rescue dogs, and that a portion of the sales goes to the Humpty Dumpty Institute. By the way, one of my lucky readers can win a free bag of their choice of pet food. Just use Rafflecopter form below to enter to win.